Ultra Pro stock number 84357. 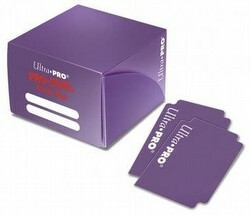 Holds 180 cards in Ultra Pro deck protector sleeves in two compartments. Each compartment holds 90 cards in sleeves. No PVC. 2 card dividers inside.